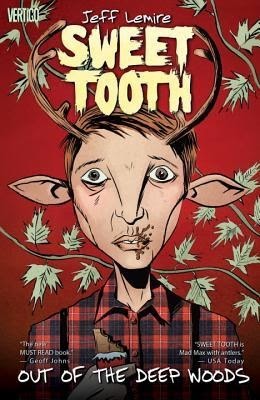 SWEET TOOTH tells the story of Gus, a rare new breed of human/animal hybrid children, has been raised in isolation following an inexplicable pandemic that struck a decade earlier. Now, with the death of his father he's left to fend for himself . . . until he meets a hulking drifter named Jepperd who promises to help him. Jepperd and Gus set out on a post-apocalyptic journey into the devastated American landscape to find 'The Preserve' a refuge for hybrids. I didn't want to read this book, because I really didn't like the cover And yes, before you comment, I am one of those people. I judge books by their covers. I know I'm not the only one, and I know that I have been severely burned by pretty covers with terrible innards, but it happens. There was just something about a young boy with a flannel shirt and antlers sticking out of his head that did not get me all excited to check out the series and dive in. But for some reason I did, and I'm not even really sure why. It might have been that the entire series was available at the library and I knew they would be quick reads in a desperate attempt to reach my 2014 reading goal (which I fell short of by 3 tiny books :( or the fact that it kept popping up on "you should totally read this series" lists. Whatever the reason, I picked it up. And I loved it. I mean, like, really loved it. It's kind of a new story mixed into a lot of really old stories. One of the covers said it was "Bambi meets The Road," which seemed sort of accurate. And it also kind of felt like the The Walking Dead without the zombies...and maybe a little like Mad Max. In other words, the world is falling apart and there are some super creepy survivors who you should stay away from at all costs. Basically, a plague is killing off the entire population, but at the outset of the pandemic, mutant babies are being born. Hence our lead, Gus, the sweet, loyal kid with antlers sticking out of his head. Some of the creatures are kind of creepy and more animal than human. Others, like Gus, walk, talk, and act just like a human...but with a pug hooves. Gus is living in the woods with his father who tells him, no matter what, to never leave the woods. There are terrible people in the world beyond who want to help him. When his father succumbs to the plague, it takes, like, five minutes for Gus to disobey and hitches a ride with Jepperd, the mysterious fighter man who can seemingly not be killed. They go seeking "The Preserve" to keep Gus safe, but well, you can kind of guess what happens from there (but you should still read the series :). Gus is brave, so much braver than he has any cause to be. He makes friends easily. He's inquisitive, and loyal, and forgiving, which I think is his best trait. It would be so easily to fear everyone in an apocalyptic world, but Gus chooses to believe, and trust. The story has heart. The relationship between Gus and Jepperd is a tenuous one, but it's built on that foundation of of trust and forgiveness, really drawing the reader in and caring about what happens to the both of them. And while the world is full of crazies, it is still filled with genuine people who are ready to care and fight for those they hold dear. It's intense, and sad, and just filled with awesome. And it's on six short volumes, so it takes no time at all to power through and read it. So you should...you know, read it. And then come let me know what you think. If you need a break from superheroes, like the apocalypse, or get really into creepy hybrid creature people, this should be your next checkout from your local library.